When Christine and John were in Tanzania earlier this year they experienced untypically heavy ‘long rains’. Farmers had been experiencing limited rainfall in recent years but not so in 2018. In fact, too much in too short a period causing serious damage and loss of life. Mwanza was not spared the deluge, and flash flooding has caused damage to the foundations of Rev Deuli’s house. Rev Deuli is our Project Leader in Mwanza, and lives ‘up the hill’. This is not uncommon, as Mwanza is set in a series of valleys and on granite outcrops, giving it the nickname ‘Rock City’. Instead of waiting for his house to fall down, Rev Deuli is proactively building another home adjacent to the old one. 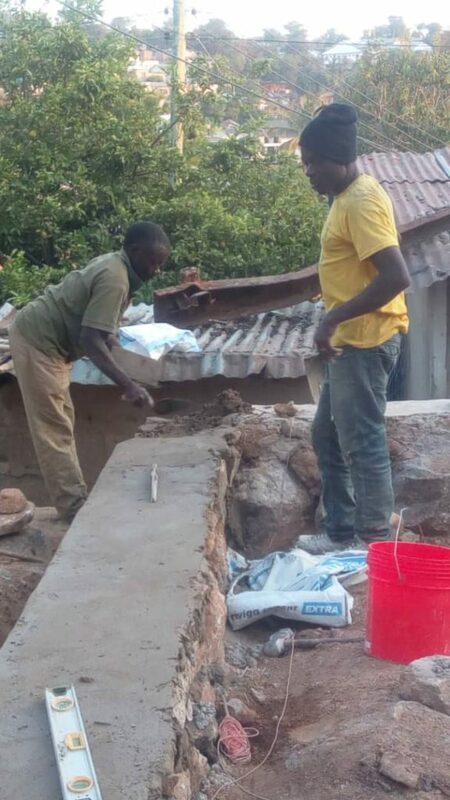 In Tanzania, construction occurs when money is available and can be a family/community activity. So far, the foundations are in place, with help from a younger brother and church congregation. It make take a while, but the house will be built and, being a wise man, the pastor is building his new house securely on the rock!